1. Biggest Middle school fashion mistake In middle school? Oh my gosh... there were just so many!!! How do I choose??? I think I'll go with the perm. It was very poodle like. What were we thinking in the late 80s??? 2. Who were your best friends in high school? Pics? Sally, Kara, Monica, Chenoa, Deirdre. Although I had a lot of other close friends, I would have to list these as my best. (Searching for these photos I realized I have a TON of photos of my friends... but very very few of me WITH my friends. I guess things never change.) Oh the memories I have with these girls. 3. What was a typical weekend like for you in high school? I guess I'll start by saying a typical high school weekend depended on the season. I was on the marching band color guard (I can twirl a mean flag) so Fall weekends usually involved a football game. I managed the fencing team so Winter/Spring usually involved a meet. My photo albums are filled with marching band pics and fencing pics. And then there was bowling. We bowled A LOT. Friday night Rock & Bowl was our thing for a while. You would think with the many nights of bowling I would be a great bowler... but that would be totally false. We also had many evenings at Friendly's. Headquarters Plaza for movies. 4. Did you have any boyfriends? Tell us about that. I "dated" one boy (Greg) during high school for a couple of weeks. He was a friend I hung out with a lot with our group of friends. I really had no idea he "liked" me until he leaned over and kissed me in the middle of a movie. I remember he would do all of those things high school boyfriends were stereotypically supposed to do (like wait for me by my locker or outside my class, carried my books, cut gym to sit with me in my lunch period). I think he just overwhelmed me with being so sweet and attentive. I remember telling him something like it was too much and I couldn't handle it. (Oh... if only I knew how long it would take me to find another guy to be so sweet and attentive!!!) Unfortunately that kind of totally ruined our friendship... which really sucked because he was a good friend. 5. Did you have any secret codes with your friends? Spill your secrets! I don't remember any secret codes. Am I missing out on some major experience because we didn't have secret codes? Do most friends have secret codes? 6. If you could relive one day/moment/experience from middle school or high school, what would it be? I have to say... looking back through all of my old photos, I really had an amazing high school experience. Sure, there was the awkwardness (which I still sometimes feel) and the acne (which I still sometimes get) and the homework (which you have to pay attention to again as a parent)... but I went to an awesome high school with amazing friends (wait a minute... what were the negatives???). I love my life now... but I honestly wouldn't mind reliving a little bit of high school. Now... if you want one experience that I would definitely CHANGE about high school... off the top of my head, I would go with Prom. 1. The boy I dated for a couple of weeks? I wish I had been dating him around Prom. Greg actually went with my friend Steph and I found myself thinking that if we'd still been friends we would have had a great time together. (Not that there was really any problem with my date. We just didn't know each other well.) 2. I also would NOT have worn the dress I wore. I don't know what I was thinking. I had bought a really cute dress with my Aunt... but I second guessed myself at the last minute and ended up with teal and satin and puffy sleeves and lace and a bow. Ugh. Just... ugh. 3. And... it's over 20 years later... and I still can't explain the mess of a weekend that was our NJ shore after-prom weekend. So, yes... I would LOVE to go back and change that whole Prom experience. 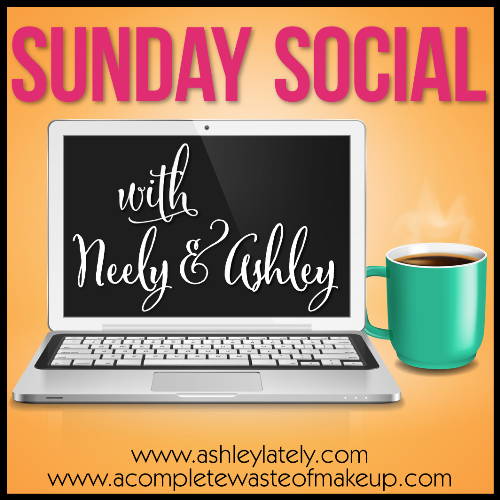 Visit Neely and Ashley to check out the whole list of Sunday Social participants! Next Weeks Questions: We're sharing Pinterest pins! While I do use Pinterest... I'm really going to have to think about these favorite things. We'll see what happens? 1. What is your favorite outfit pin? 2. What is your favorite food pin? 3. What is your favorite wedding pin? 4. What is your favorite DIY/craft pin? 5. What is your favorite quote/verse/lyric pin? 6. Share one more random pin you love. Now you tell me? Any fun school facts you want to share with me???? Spill it!